Here's a fun way to spend some time in the great outdoors: Hike into a caldera then spend a night in a tent 400 yards from an active volcano with ash raining down and rocks falling all around. That's what Kayleigh Kulp, a writer for the travel section of the Washington Post, did in Guatemela before scribbling a column extolling the wonder of the experience. Sounds cool right? No, says volcanologist Jessica Ball of the U.S. Geological Survey, who has visited that volcano, called Santiaguito, and wrote in a blog post that Kulp's overnight hike was dangerous and irresponsible. The problem, at the end of the day, is not geological. It's human. Tourists flocked by the thousands to a different volcano in Guatemala even after a TV reporter was killed by a lava flow. They wanted to see an eruption, and that's just the way things go. But Ball says people can see amazing volcanic activity without jeopardizing themselves if they just take a moment to be smart. She was kind enough to answer Inverse's questions about volcanic exploration. In places where access to the volcanoes isn't regulated, it becomes more difficult to evaluate the safety of tours. In general, climbing to the summit of an active (erupting) volcano is a dangerous proposition even when previous tours appear to have been safe. Hikers should use common sense and ask questions of the guides before going on a tour (like whether there are emergency plans in place if someone is injured or gets sick, whether the guide knows first aid/has supplies, whether everyone will have adequate food/water/gear). 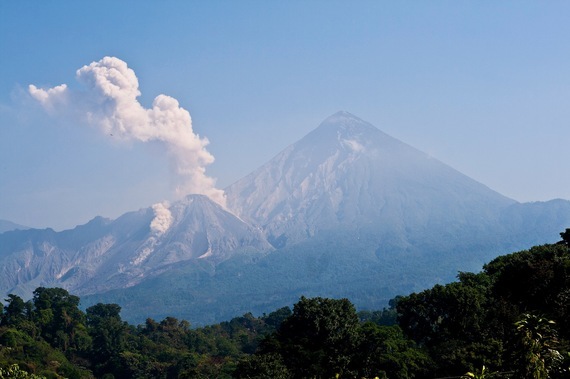 They should ask if there is a risk of being hit by volcanic tephra (ash or rocks), and whether there are safer vantage points on a hike if it goes near the summit of an erupting volcano. I would say that if they want to make the personal choice to put themselves in danger, that is ultimately their decision. However, they should also consider how their decision affects the guides who go along with them. In less wealthy countries (like Guatemala), people can make a lot of money providing services to tourists. However, many of these local guides don't understand all the dangers of the active volcanoes that they may be hiking on, or how unpredictable they can be. The upshot of this is that tourists who go on these hikes are encouraging local guides to put their lives and their clients' lives in danger. The consequences for the tourists could certainly be tragic, but what happens to the families of the guides if their father or mother or husband or wife is killed or injured? That person may well be the sole provider for the family, and the consequences of an accident could have a much bigger impact on them than on their clients. I do think that it's important for outdoor enthusiasts to educate themselves about the hazards and risks of any activity they attempt, and in the case of hiking on a volcano, that includes learning about the past and current behavior of the volcano in question. It's really a due diligence issue. How dangerous is it, really? No deaths in the area seems like a pretty good track record, even if it's one that could end any time. Just because no one has died doesn't mean it's not still dangerous. I personally think it's been sheer luck that no one's been killed at Santiaguito recently, given what I've seen on a few internet videos of people who have gone on those hikes. However, a dome collapse at Santiaguito in 1929 killed hundreds (possibly thousands) of people, and in volcanological terms it wasn't a catastrophic event. And the recent activity at Santiaguito, which is much more vigorous than its "typical" behavior, could easily have killed someone had they been at the summit of the active dome at the wrong time. Again, it's plain luck that no one was. What's the most amazing thing you've seen while observing a volcano? I think the most impactful experience I've had on a volcano was at Santiaguito. It was our first day working on the domes, and we were heading to the top of the inactive dome furthest from the active eruptions. I heard what I thought was a plane going overhead, but when we saw the ash plume rising overhead we realized that it had been an eruption of the active dome, and when we summited the dome we were climbing and were able to see the rest of the complex, I saw just how big the domes were and how massive the volcano behind them was and the size of the crater that formed from the 1902 eruption.